Looking for a family holiday, a romantic week-end, a gourmet trip, an escape to nature, or a cultural trip ? Discover Pays de la Loire, naturally rich in holiday ideas! Pays de la Loire offers a variety of extraordinary offers. Family destination par excellence for families, the area offers a wealth of landscapes and architectural landmarks. Come and choose a place to stay on the Atlantic coast, in the Loire Valley or in the vibrant cities of Nantes, Angers or Le Mans. Don’t forget its vineyards, cycling routes, natural areas and charming villages ... 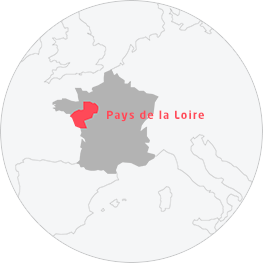 Pays de la Loire is the ideal destination for your next stay! To prepare your stay in Pays de la Loire, download or order our brochures. Pays de la Loire is the ideal place for your holidays, weekends or short breaks. The region has plenty of activities that can fill your trip, and lots of entertaining things to do and see when traveling with a family. Short of holiday ideas? Make your choice: Atlantic coast, Loire Valley, city break, cottage in the countryside or culture... Pays de la Loire will suit all your different needs and wants!